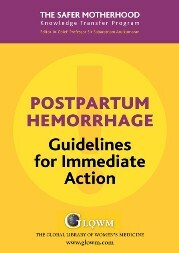 The Global Library of Women’s Medicine has included the NASG in their updated Postpartum Hemorrhage Guidelines. This is a wall chart detailing important clinical aspects of controlling postpartum hemorrhage and will soon appear on their Safer Motherhood webpage. We are so pleased that the use of this important first aid device is recognized as an important step in saving a hemorrhaging woman’s life.